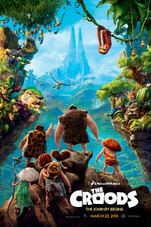 The Croods is a prehistoric comedy adventure that follows the worldâs first family as they embark on a journey of a lifetime when the cave that has always shielded them from danger is destroyed. Traveling across a spectacular landscape, the Croods discover an incredible new world filled with fantastic creatures -- and their outlook is changed forever. It captures the wonder (and more gently, the anxiety) of discovery time and time again. And the filmmakers have a hoot playing with the Croods' encounters with, as well as their misunderstandings of, all things new. How to Train Your Dragon" and "Lilo & Stitch" are completely indicative of the experience you'll have with "The Croods," which is to say a supremely positive one. A film which, if not truly sophisticated, isn't nearly as crude as advertised.